CANTAR'S new PROTECT-A-POOL®Fencing system adds a new level of security to above ground pool safety. The modular pool fence is made from sturdy yet lightweight rustproof resin and can be installed by pool owners with little effort. The attractive pool fencing keeps toys, balls and floats within the pool and at the same time minimizes pool use by unauthorized guests and pets. 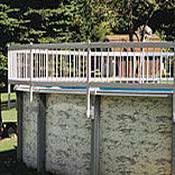 Protect-A-Pool fencing uses mounting brackets specially designed for easy installation on all common makes of above ground pools to accommodate different pool top seats and top caps to give the appearance of a "custom" fit. Our unique packaging method allows the consumer to buy only what they require. Base Kit "A" 4300400 (8) section base kit. Every installation will require one base kit. Base kit includes two end posts; one to start the installation and one to complete the installation. The number of fence sections on a pool vary by pool size, shape and manufacturer as well as decks, ladders and other forms of entrance systems to the pool. 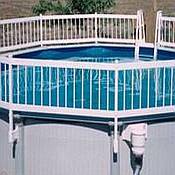 One fence section covers one pool top seat/top rail, or the distance between two pool uprights up to 61" in length. Smaller sections can be cut to length. To determine required kits, please refer to list below.